There are many natural foods that are assumed to help in fertility, but Royal Jelly is the king. It has been used for centuries to help in the treatment of infertility. Royal Jelly is a milky white substance that comes from worker bees. This substance is used to feed the honey bee larva in the first days so they can grow healthy. 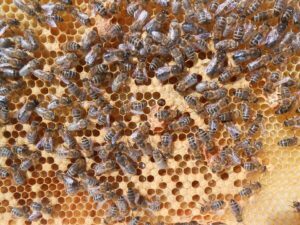 Only one bee is fed with Royal Jelly during her entire life: the Queen. And this is why several questions were raised about Royal Jelly being able to help on fertility. The Queen bee lasts 5 to 6 years while the other bees only live for 45 to 60 days. Besides, only the Queen is able to produce eggs, while other bee’s reproductive system isn’t completely developed. Arginine, one of the amino acids found in Royal Jelly, is very important for men since it increases the production of testosterone. Folic acid, which is also contained in Royal Jelly, is another important nutrient that is vital in protecting against Spina Bifida. Menstrual problems are one of the major causes that reduce the chances of women to get pregnant. And, the Royal Jelly works as a great natural medicine to regulate their menstrual cycle. reduce the signs of aging. There have been different studies trying to prove the real effects of the Royal Jelly. However, we cannot really conclude anything about the studies made on humans because there aren’t many testing results that were made. There was one study, however, conducted by Bogdan Tekavcic, a gynecologist. He discovered that women who took bee pollen with Royal Jelly saw their menstrual problems completely solved or improved. A 2007 study done in Japan with rats, showed that Royal Jelly helped with the estrogen, which is crucial for a healthy menstrual cycle as well as for healthy bone formation. A different study was made with male rabbits in 2010. The results showed that their testosterone levels increased almost 150% and their sperm output increased around 65%. There is no question that Royal Jelly can help your health. It is definitely a superfood since it contains such a wide variety of nutrients. Regarding fertility, and taking into account what it does to the Queen bee, as well as all the animals’ studies made, it can actually help both men and women. It will solve or improve some problems that might be affecting your fertility like hormonal imbalance. Just make sure that before you take your Royal Jelly, you are not allergic to bees. Otherwise, you can have severe health problems.